When Gary Brunsman of Hamilton, Ohio set out to help community workers learn the basic skills of welding, he ran into a problem: Materials. Brunsman and his students had trouble finding metals that they could use when practicing the fundamentals of welding. They did, however, come across plenty of scraps. That’s when Brunsman got the idea to start converting the scraps of metal in his area into creative art pieces through upcycling. Upcycling is the process of reusing an object in a new way, without degrading the material from which it is made. This is different from recycling. The recycling process breaks a product down in order to reintroduce its basic materials into the manufacturing cycle; a process that consumes more energy and lacks the creative outlet that comes with upcycling. Flowers at the Gallery of Dixie made from hub caps, pot lids, plumbing tanks. and box spring rolls. Brunsman uses upcycling to create virtually anything he can imagine. Old pot covers, pans, hubcaps and bicycle parts can become anything from flowers, to sculptures, to fences. Now that he can provide his trainees with materials to practice their craft, his biggest challenge is coming up with creative projects. The pieces made by Brunsman and his students often take the form of lawn art or welding sculptures. They are then sold to the public or donated to schools, charity events, or churches. Some have even been entered into art festivals. These upcycling projects allow students to practice different welding techniques, including shielded metal arc welding, flux cored arc welding, gas tungsten arc welding, oxy-fuel welding and gas metal arc welding. Moreover, the refinement of these creative works gives students practice with drills, mills, grinders, saws and manual cutting techniques like handheld plasma cutting and carbon arc gouging. Upcycling pieces of scrap into works of art even gives students practice with grinding, sand blasting and painting as they put the finishing touches on their pieces. 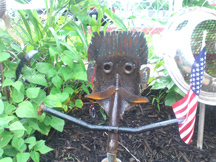 A discarded coal shovel makes a great flag holder and a charasmatic face. Brunsman was introduced to welding as a Boy Scout. He then assisted in maintenance and repair jobs as a teen. This led him to a career in production maintenance welding. Brunsman developed a passion for teaching others to weld and served as a welding instructor at the Greater Oaks Career Campus in Cincinnati, Ohio, for 8 years. He left Greater Oaks with a mission: to train unskilled workers and offer them the skills needed to connect with potential employers. Brunsman’s mission took shape in 2000 when he acquired the Dixie Welding fabrication and repair shop. In 2012, he opened the Gallery of Dixie to display and sell the upcycled pieces produced at Dixie Welding. The gallery, located within the facility, is open from March through December. You can find out more on their Facebook page. These days, Brunsman is working on completing his three-step approach toward retirement. The first step was opening the Gallery of Dixie, which he plans to grow. The second step is to expand his training program to include welding technicians, artists, auto technicians and retirees. He would also like to provide employers with tutors to help prep their new hires. In addition to these efforts, Brunsman hopes to employ bilingual instructors in order to help immigrants in the community who want to learn welding. 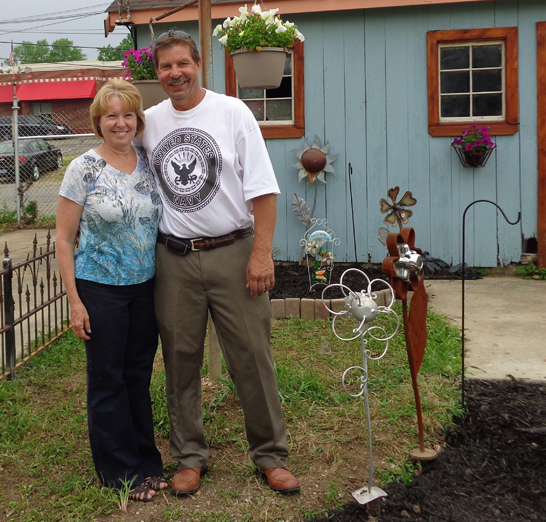 Gary and Diana Brunsman display their upcycled creations at Gallery of Dixie, a studio they opened in 2012. Brunsman’s final step is to form Dixie Welding Solutions; a resource network for in-house and on-premises training, that will provide assistance with process and engineering functions, and quality control. To get the full story on Gary Brunsman and Dixie Welding, check out “The Art of Upcycling: Welding Trash into Treasure” by Melissa Gomez in the March 2014 edition of the Welding Journal. The Welding Journal is available free with your membership to the American Welding Society.